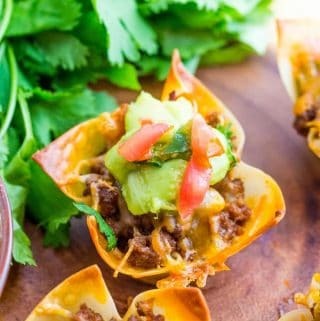 Crunchy wonton shell is filled with a cheesy, beefy center and topped with cheese and baked until bubbly! In skillet brown your ground beef until no longer pink, drain. Add in your taco seasoning and stir until distributed, stir in your pico de gallo and 1 cup cheese and mix until melted, set aside. Spray a 24-count mini muffin tin with non-stick cooking spray and place wonton wrappers in wells of each. Bake for about 10-12 minutes or until golden and cheese is melted. Remove from oven and top with guacamole, cilantro and pico de gallo.